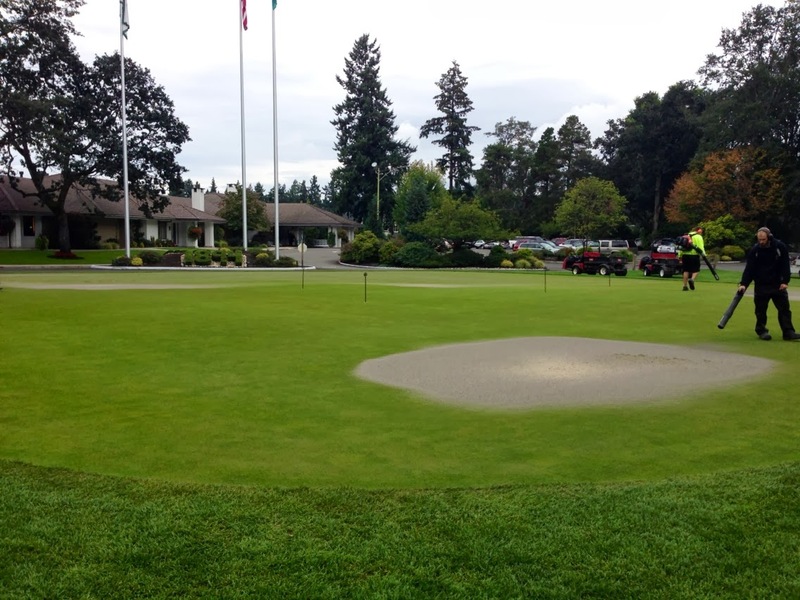 If you make it out to the Club this weekend, you should be pleasantly surprised with the condition of the greens considering they were punched on Monday, or just 5 days ago. Above you see what they looked like Friday afternoon. Basically they are playing just a little sandy and not bumpy at all. Why are they so good? Well this fall we are trying something a little different. Instead of punching with a 1/2" tine like you see on the right, we punched with a 1/4" tine like you see on the left. 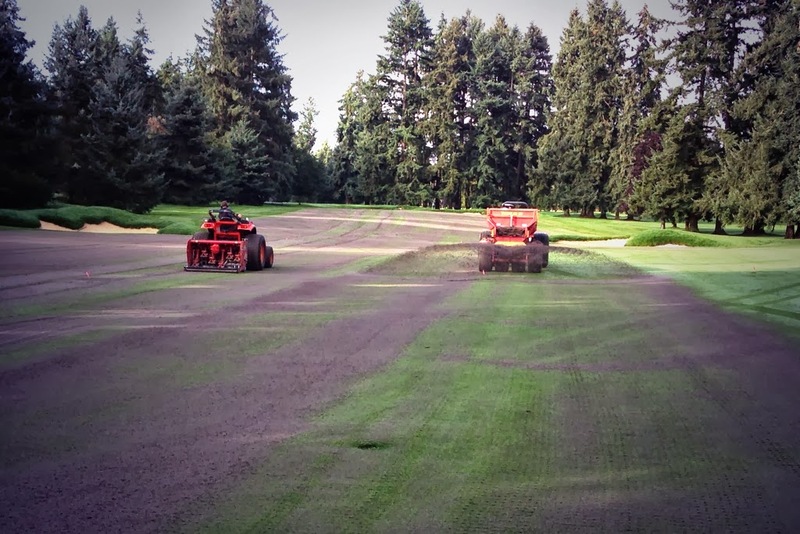 Of course they are going to heal much faster with this strategy, but it also means we are removing much less organic matter (OM) and that could lead to softer surfaces that drain less readily. I say "could" because honestly I'm not so sure which is why I want to try this out. 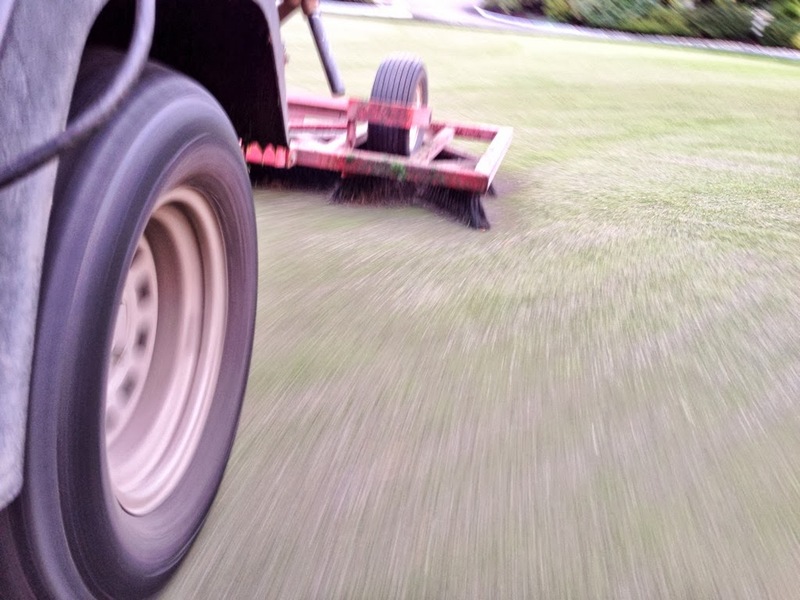 Clearly with the smaller tine we are disturbing a smaller percentage of the surface, but because the tine is thinner, we can punch deeper and actually remove the same amount of total material as with the larger tine. 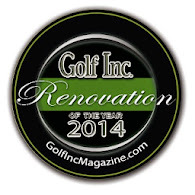 We proved this on Monday when we used the same amount of sand as always to fill the aeration holes. 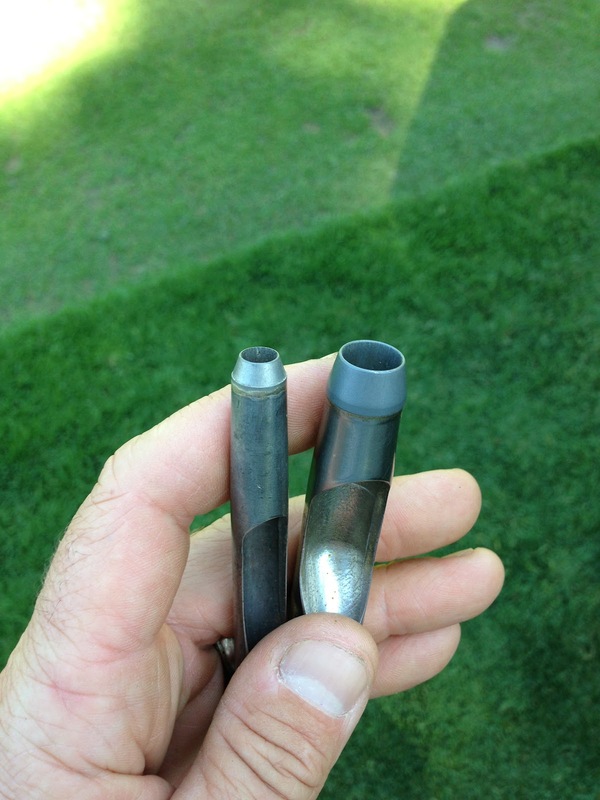 Now the plan all along was to punch them again with this smaller tine in October so as to make up for the decreased surface disruption versus the larger tine. 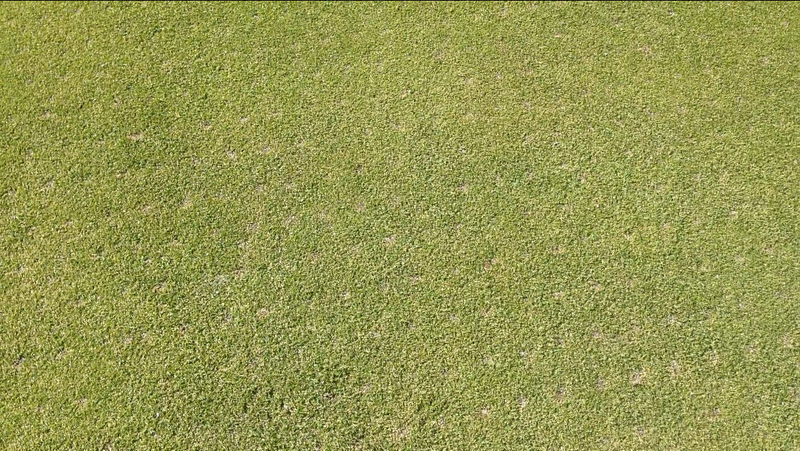 If that works out, we will get even more sand on the greens which means this method might actually do a better job of thatch management compared to our past treatment with the larger tine. But time will tell and we will continue with this method until we actually can see if it is working positively or not. How will we determine the performance of this method? By taking soil tests. 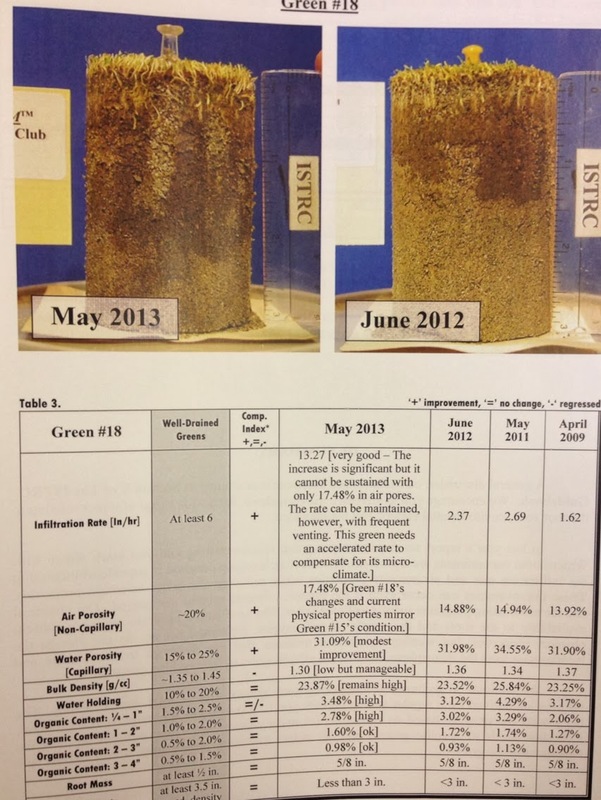 Above you can see the results of 4 years of soil testing. If you look at these numbers, you can see that there really isn't a significant change in the values from 2009 up until this year. Since 2009, we have done the same thing in the spring and fall with the 1/2" tine, and just in the last year, we have increased our frequency of solid tine venting significantly. I think it's safe to say everyone is happy with the firmness of the greens and the rate that they drain, so we don't need to get more aggressive necessarily. 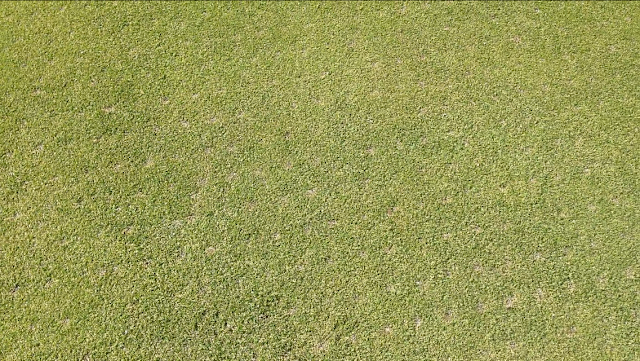 So the idea is we change to the smaller tine which means the greens will be in better shape immediately after punching, and simply punch them an additional time to make up for removing less surface area by using that smaller tine. The only way to know how this is going to work is to try it for a while and keep testing to measure the results. 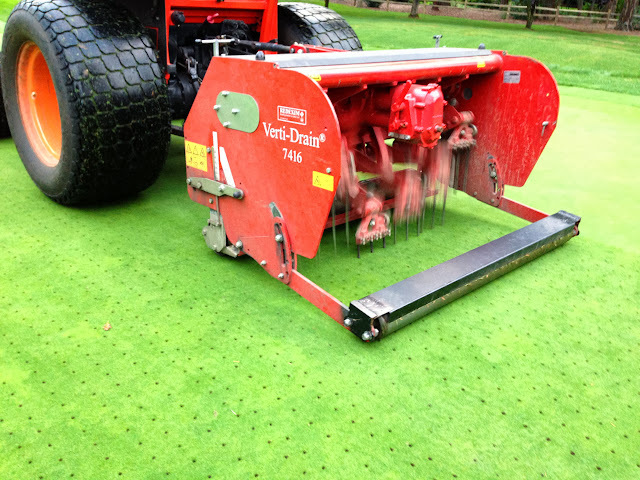 Now don't forget that we've added another aeration treatment in the last year...............the deep tine aerifier. 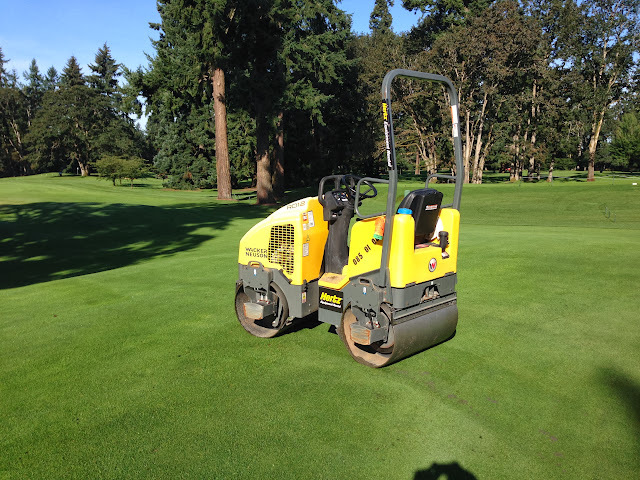 In the picture above, you see this machine in action, and click on the video below to see it working on the second green this past Monday morning. I just love this machine and with it we have totally changed the way the course drains. I can honestly say I don't think there's a situation of slow drainage on this property, that can't be fixed with this machine. On Monday we started aeration of the greens by first running this machine over them using a 1/2" tine that was punching 8" deep. 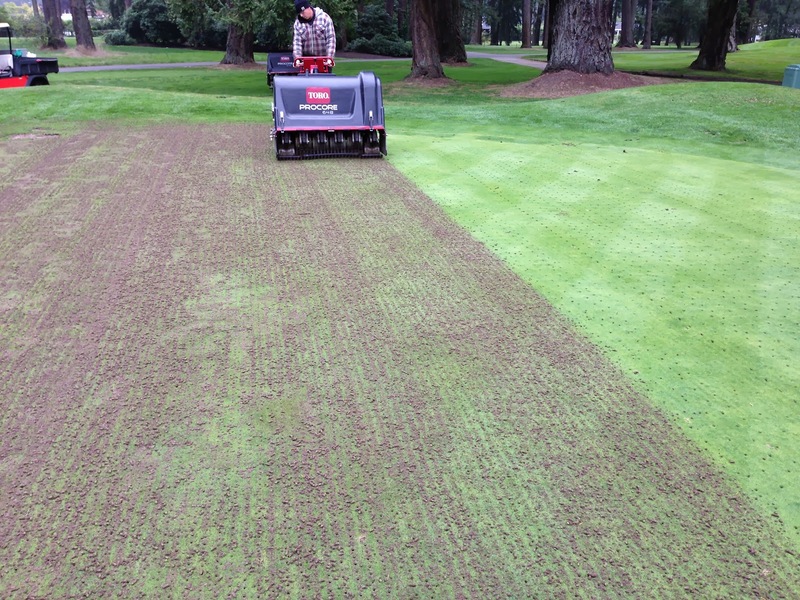 Then the surface was punched with the 1/4" tine at 3" deep. The surface was cleaned off using backpack blowers. Sand was applied and brushed in. Extra sand was blown into piles and picked up. 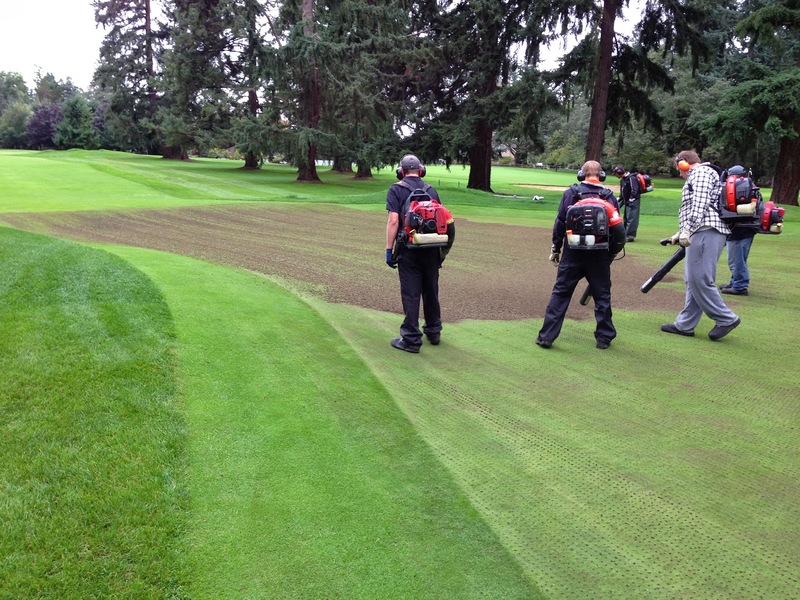 Finally, the greens were rolled with the "one ton roller" to correct the surface disruption. Again, they turned out really good and are rolling great just days after completing the aeration process. The weather has been perfect for aeration so we also have punched and sanded most of the fairways this week. In the next 24 hours, it's predicted that we will get over an inch of rain. If that happens, the sand will get washed in nicely and the course should be ready for play right away. I hope you find time to get out there and check it out.